We are saddened to announce the passing of our wife, mother, sister and grandmother on July 15, 2017. After suffering with many medical issues, Connie passed away at the age of 82. Connie was born on July 15, 2015 in La Glace, Alberta to Abraham and Elizabeth Konrad, and completed her education in Abbottsford, British Columbia. She enrolled in a nursing program along with her sister Irene, and together they trained at St. Paul Hospital in Vancouver, BC. She is survived by her partner and husband of 35 years, Mel Sasek, her children John, Shelley and Brian Dickson, step sons Lyle (Melinda) Sasek, Jared (Tara) Sasek and two grandsons Keith and Bradley. 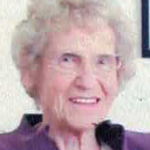 Connie will be missed by numerous nieces and nephews, along with her brothers Abraham (Mary) Konrad, Jakob (Ruby) Konrad, Daniel (Rosanna) Konrad and sisters Helen Knight and Irene (Vern) Kopp. A Memorial Service will be held at the Blackpool Hall Sunday August 20, 2017 at 2:00 p.m. W Old N Thompson Hwy, Clearwater, BC.